Twelve patterns for the garden, including three wind chimes, five birdhouses, an adorable rabbit and three garden markers using mini gourds. Although Great Garden Gourds is currently out of print, check out our other great books. Hummingbird Hill was founded by Aurelia Conway, TDA . She specialized in acrylic designs for gourds for beginner and intermediate painters. Her patterns and books feature hard to find ideas for gourds of various sizes and shapes. Each pattern includes photos, detailed drawings, complete painting instructions, plus added information on cleaning and preparing these surfaces for painting. She has had her patterns in the Decorative Painter and Painting Magazine. She has been a member of the Society of Decorative Painters since 1991. She has been certified by SDP as a Teacher of Decorative Art, TDA and is currently serving on the Education Comm. Aurelia has been painting for over 30 years. She has worked with acrylics for 28. She has been teaching and designing her own patterns for the past 14 years. Her work features birdhouses, Santas, folk art scenes and other unusual ideas for gourds. Much of her painting is inspired by her love of gardening and the birds that she enjoyed on her rural Southern Indiana farm, Hummingbird Hill. Aurelia taught nationally and internationally. As a former school teacher, she understood the importance of teaching style and preparation. Classes focused on developing the skills of the experienced beginner and inspiring the intermediate painter to creatively expand their knowledge. She has taught at the Society of Decorative Painters annual convention, Extrav-Painting Expo in Florida and New Jersey, Heart of Ohio Mini Convention, other mini conventions, SDP Chapter Seminars or Retreats and many large gourd shows. Her first book, Gourds: Naturally Sensational was published in August of 1999 by Plaid Enterprises. 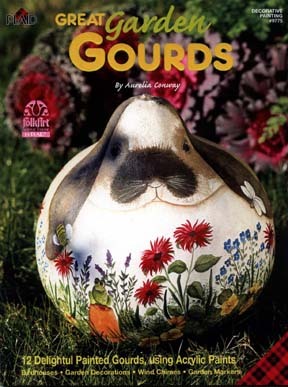 She now has seven titles to her credit, including: Birdhouse Gourds and More, Gourdgeous Homes for Birds, How to Paint a Gourd, Gourds in the Garden, Gourd Purses and now, Great Garden Gourds. She was the President of the White River Decorative Artists Chapter, and a member of the American Gourd Society and Indiana Gourd Society. She was the top selling artist for Plaid Enterprises in 2000 and 2001.